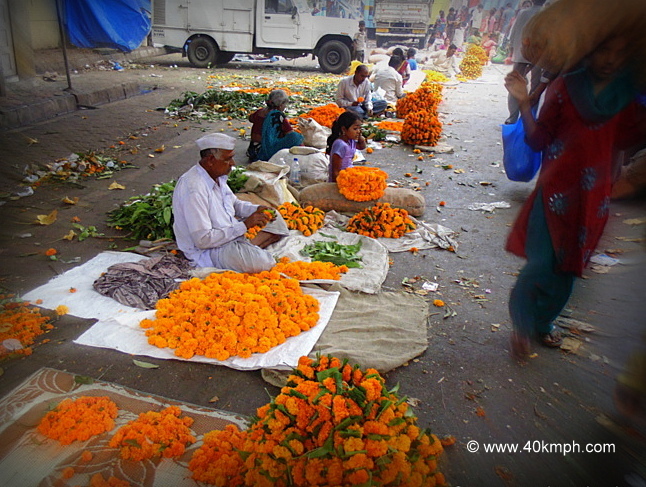 Early morning Diwali day I decided to visit wholesale flower market at Dadar to purchase Marigold garland. The price was in the range of Rs. 20-40 per meter. I purchased seven meters marigold garland and the cost Rs. 20 per meter. And then I inquire about marigold petals. Rs. 40 per kilogram she said. We paid Rs. 20 and had approx. half kg. marigold petals. Yes, Wholesale market at Dadar, Mumbai is indeed cheapest from the market I have nearby house. Total Rs. 160 I paid and was carrying Marigold flowers inside a sack. If I was at home maybe the same flowers would have cost Rs. 300 I guess.